Calling all food connoisseurs, music lovers and imbibing enthusiasts! 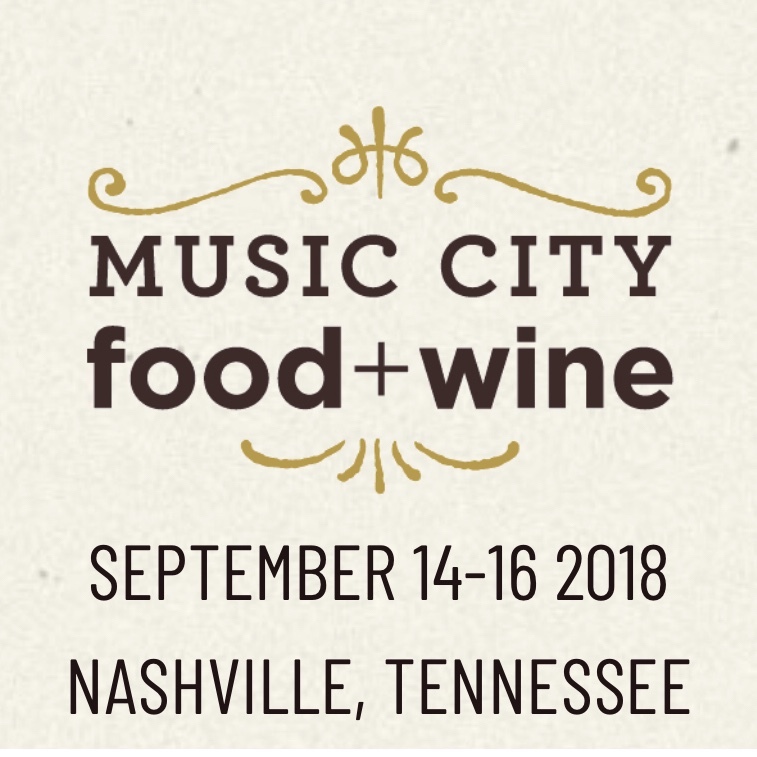 The sixth annual Music City Food and Wine Festival returns to Bicentennial Park on September 14-16, 2018. Hands down, this is one of my favorite Nashville events. For the most part, festival programming will remain the same as it was in 2017, but there are a few new additions I want my readers to know about! Nashville is known for honky tonks, hot chicken, and hockey, but isn't it about time that we have an official drink of Nashville? On Friday evening, partake in the ultimate happy hour where Nashville's top bartenders and mixologists compete to create the Official Drink of Nashville. "this competition will celebrate the spirit of Nashville and shine a spotlight on Music City's talented bartending community. The city's best bar teams will mix, shake and measure to create this year's essential Nashville cocktail. Enjoy bites from top chefs & restaurants, wine and cocktail tastings and more." If imbibing isn't your thing, head on over to the Friday night throwdown where chefs Anne Burrell and Tim Love go head to head in a spirited cooking demo captaining teams featuring celebrity sous chefs from our very own Nashville Predators and Tennessee Titans. Where are my Studio 54 fanatics? Pull out the velvet jumpsuits, plunging necklines, and sassy sequined clothing for this year's Harvest Night where Kings of Leon along with other special musical guests will be performing iconic disco hits from the 70's and 80's. Guests can enjoy bites from 7:00-9:00 pm with Studio 54 tunes beginning at 9:00 pm. "Chefs scheduled to cook at Harvest Night include: Jeni Britton Bauer (Jeni's Ice Cream);Tom Bayless (The Public House); Matt Bolus (The 404 Kitchen); Sean Brock (McCrady's, McCrady's Tavern, Husk, Minero); Maneet Chauhan (Chauhan Ale & Masala House); Carla Hall (ABC's The Chew); newly minted James Beard Foundation Award-winning "Outstanding Chef" Gabrielle Hamilton (Prune); Tim Love (Lonesome Dove Western Bistro, Woodshed Smokehouse, Queenie's Steakhouse, Love Shack, White Elephant Saloon); Margot McCormack (Margot Café & Bar); Aarón Sánchez (Johnny Sánchez); Chris Shepherd (UB Preserv); Jonathan Waxman (Barbuto, Jams, Adele's, Brezza Cucina); Tandy Wilson (City House); and Andrew Zimmern (TV personality, Andrew Zimmern's Canteen)." In addition to the panel discussions, cooking demos and the grand taste, Pitmaster Pat Martin will be joined by friends, chefs and other well-known pitmasters for Martin's Bar-B-Que Joint and Friends. This event is always entertaining as Pat and his buddies will cook and serve the most fantastic live fire bar-b-que. You never know who may be at the helm of this feast because last year I ran into Andrew Zimmern cooking over the hot coals. For my bourbon enthusiasts, Pappy Hour will return on Saturday, September 16th. "This exclusive bourbon tasting will be led by Preston Van Winkle of Old Rip Van Winkle Distillery, great-grandson of iconic bourbon maker Julian P. "Pappy" Van Winkle. More information n how to attend Pappy Hour will be announced this summer. " One event that I haven't had the opportunity to attend is the Gospel Brunch. To be honest, I am usually so wiped by the time Sunday comes around, I never make it. My friends who have previously attended have raved about both the music and the food. After all, who doesn't love a good brunch? Tickets to the Music City Food and Wine Festival are on sale and can be purchased here. Want my advice? Purchase an all-access pass... you don't want to miss a minute! But if you can't splurge on the all-access pass, I'd opt for one of the following: Saturday Day Pass (Fantastic cooking demos, access to the Grand Taste and one hell of a dance party Saturday afternoon when they shut down) or Harvest Night (Stellar chef line up and an intimate KOL concert- and you know they are going to bring some great guests out). For more information about the Music City Food and Wine Festival click here.